pulling of growths and other phenomenal properties. Some rocks are vitrified and stones looks as if a layer with metallic sheen once covered it vitrified-rock. It is impossible to explain just how huge multi-ton stone blocks of irregular shape, even without a gap so tightly fit together, that between them is not put even a razor blade. 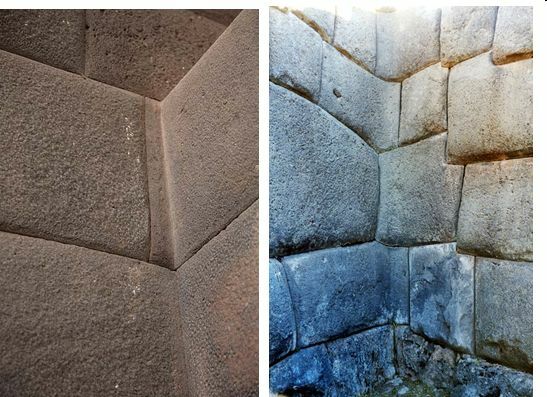 This phenomena feature can be seen everywhere: in the walls Saksauaman and Machu Picchu in Peru, Pyramid of Cheops in Egypt, Yonaguni, Japan and in many, many other objects around the world. All work of Earth people is done in accordance with the laws of the material world. All ETC objects of the System of Information Transmission are created by information technology independent of there nature. Information technology of ETC is based on the united consciousness action, and therefore demonstrate the properties of the Information world, without time and space. By the action of the ETC united consciousness created absolutely all their objects regardless of nature. ETC burned on the stone surface lines and the Nazca Lines appears, crop circles are created by curved stems of plants. ETC bend stones at 90? angle to form a particular design. These elements can be seen in Peru, Egypt, Easter Island and other areas of the Earth. So, merge of huge blocks borders reveal properties of the Information world in which there is neither space, nor time. ETC created artificial islands, for example the Easter island. The united consciousness action transfers objects to another higher sublevel of the material world to change the gravity, i.e. weight of objects and other properties. So, this way a partial dematerialization happens, which is used in ETC information technology. These features of the information world radically distinguishes the work done by man, from the works of ETC. Thousands of pictograms ETC explain the Principle and the Law of the unified consciousness formation, which are at the basis of all information technology, so amazing for humanity. The strength of the unified consciousness action is determined by the level of consciousness of people caused this action. That is why humanity of the Earth are beyond information technology that are easy used by ETC with a high level of consciousness.